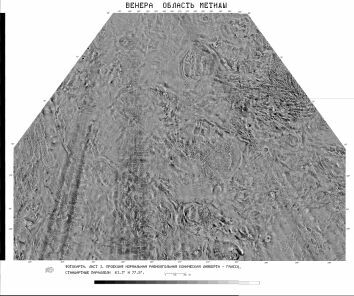 Software for Venera 15/16 Synthetic Aperture Radar mosaics. 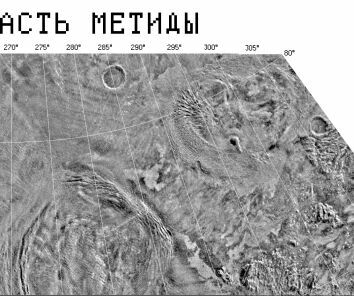 This data set contains radar image mosaics of the surface of Venus obtained by the Synthetic Aperture Radar (SAR) on the Venera 15 and 16 spacecraft. 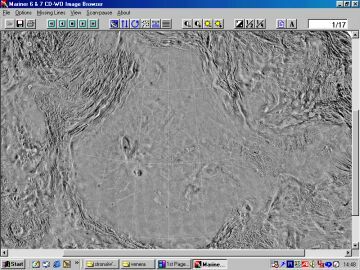 The Venera data consists of 27 images (quads) covering the latitude range of 25 degrees north to the north pole; however, two quads, the 8th and 9th, are not included because they were not available at the time the CD was produced. The quads cover the area from the north pole down to approximately 30 N latitude. There are two types of tables that describe each quad in terms of latitude and longitude ranges. Also, each quad is tiled (subframed) for fast access from the CD-ROM and is accompanied by a low-resolution un-tiled browse image. The Venera 15/16 photomosaics were processed on the PDS VAX at JPL using an obselete version of VICAR. Each quad was segmented into 16-20 full resolution sub-images, each no larger than 1200 samples by 1200 lines. A browse image was also created by scaling down the full resolution quad by a factor of 4. VeneraView is a Windows viewer for this data set. Venera 15/Venera 16 radar images. Venera 15/Venera 16 low-resolution and high-resolution images. Metide Regio. Model of Venera 15/Venera 16 . Courtesy of Russian Space Research Institute (IKI). Venera 15 and Venera 16 missions. 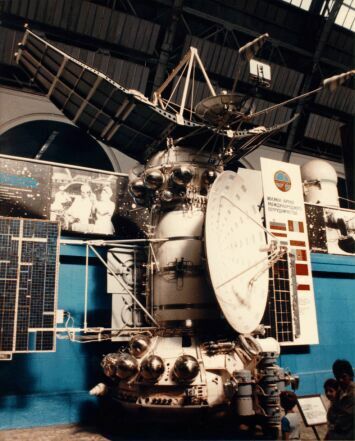 A significant step in the study of the relief and physical properties of Venus' surface was the launch in 1983 of the Venera-15 and Venera-16 orbiters. They were designed to obtain images of the surface using side-looking radar. 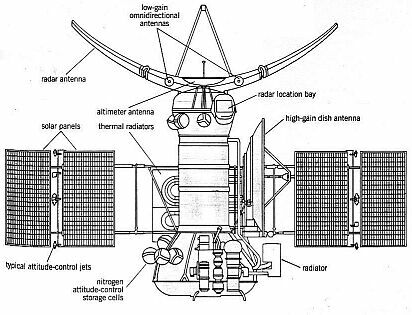 With this goal in mind each spacecraft was equipped with an array of instrumets, including radar devices and radio altimeter, and also special antennae of elliptical form with a maximum dimension of 6 meters. 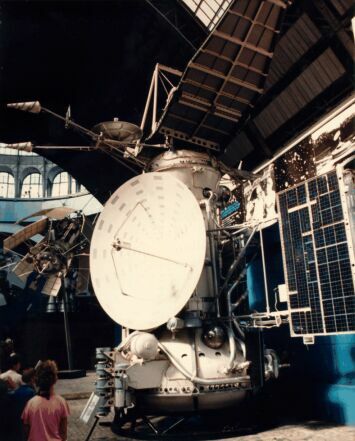 The side-looking radar furnished images of the planet's surface, and the radio alimeter provided their corresponding altitude profiles and local reflection characteristics. 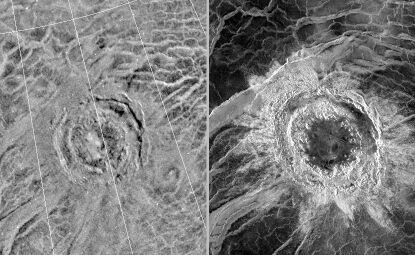 High quality images of Venus' surface were produced, in which the resolution of the relief details reached 1 - 2 km. Located in near-polar orbis with pericenters close to the North Pole, the Venera 15-16 spacecraft over the course of a year's active operation, performed radar mapping of the northern hemisphere, including polar and middle latitudes ( to ~ 30 deg) over an area of about 100 million km2, that is approximately one-fourth of the planet's surface. 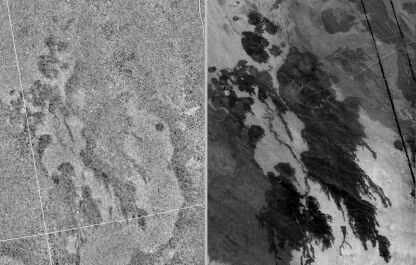 The higher-resolution imaginery obtained by Veneras 15 and 16 showed that most of the Lahshmi Planum was relatively smooth and higher than the adjacent area. The borders of the plateau are ultimately defined by the high ranges of Akna Montes to the west, Freyja Montes to the north and Maxwell Montes in the east. On Lakshmi's southern margin, a giant scarp called Vesta Rupes was discovered, beetwen 3 and 4 km high, dropping off to the south, and changing orientation part-way along its length. 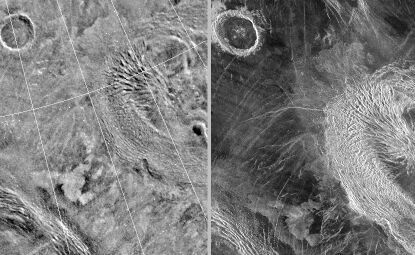 About 150 impact craters were identified on Venus from Venera 15 and 16 radar imagery. From this data Ivanov and Basilevsky estimated an average surface age of 300 to 900 million years. The largest craters are multi-ringed, followed at smaller diameters succesively by structures with double rings, craters with one ring, craters with a central peak, craters having structureless floors and irregular craters. Coronas were first identified on Venera 15/16 images, together with related arachnoids, range in diameter from 60 to over 2000 km. Coronae are definied by a concentric structure consisting of an annulus of ridges or fractures, an interior that may be topographically positive or negative, and a peripheral moat or trough. Coronae are unique to Venus, more than 360 have been recorded. 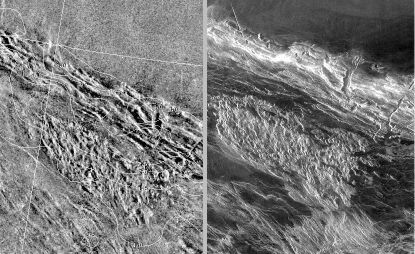 Lowlands, with their darker and smoothers radar signatures, have been likened to lunar maria and interpreted as lava-flooded basins. The image bellow shows a flat plains region composed of many lava flows, south-east of Lakshmi Planum. The radar back-scattering properties of Venus plains vary from very low to high.